Mahathir Mohamad has won a bitterly contested election. The shock victory will rattle investors, who will fret about the country’s economic growth momentum and future ties with China. For now, a quickly formed government and clear economic agenda can limit market turbulence. Official results in the early hours of May 10 show that Pakatan Harapan (Alliance of Hope) won 113 of parliament’s 222 seats, narrowly clinching the simple majority required to rule. Ruling coalition Barisan Nasional, led by Najib Razak, had 79 seats. 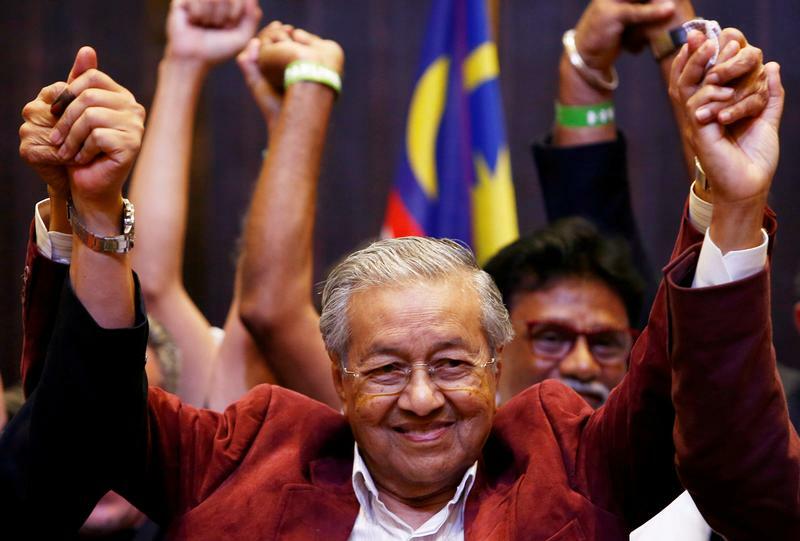 The alliance is led by 92-year-old Mahathir Mohamad, who was prime minister for 22 years until 2003. He is expected to be sworn in as prime minister on May 10. Current Prime Minister Najib was battered by the multi-billion dollar 1MDB scandal and by public discontent over the rising cost of living. He is expected to speak on May 10, at 9:45 am (0145 GMT). Malaysia’s currency weakened in offshore trading, with the ringgit one-month non-deliverable forward falling 2.4 percent to 4.07 against the dollar. Trade on Bursa Malaysia, the national stock exchange, will be suspended May 10 and 11. Mahathir will become the world’s oldest elected leader.